“What if I’m studying the wrong stuff?” “This isn’t sticking.” “I’m going to fail anyway.” These are all things that I used to think in high school, and this delayed my studying or prevented me from doing it at all. You can’t tell yourself this because it will only stress you out and you can’t study while stressed (at least not effectively). Take a step back and be realistic. You MIGHT study some information that won’t be on the test, but no test will ever cover all the material you are taught. If you study well, you’re GOING to study important material that WILL help you on the test. To be blunt, yes, you might still fail. Failing a test happens to everyone, but it isn’t the the of the world. You need to get over the “I’m going to fail anyway, so why bother studying” mentality and replace it with the “Yeah, I might fail, but studying now might be the difference between a 34% and a 59% on this test.” Every point counts and studying never hurts. The fact is, the most effective studying takes place over the course of a long time, not in one weekend immediately before the exam. You can study every day simply by doing things such as rereading your notes every day and making flashcards throughout the semester. Every day I reread my old notes before class starts and eventually that information just sticks. You don’t even have to study it anymore because it’s in your head from rereading it in your notes. 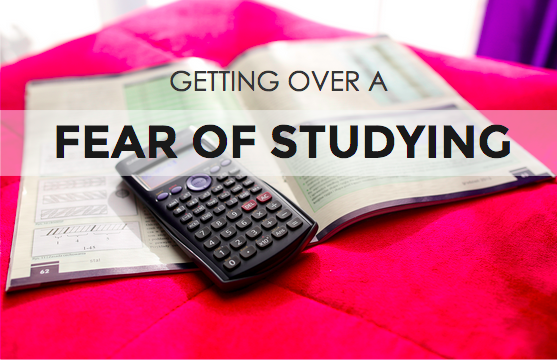 Furthermore, studying throughout the semester takes the pressure off of the last minute studying before an exam that often leads to the fear of studying. If you already know a lot of material from studying throughout the semester, that means you have much less work to do when the test comes around. This makes studying much less stressful and you’ll feel much more prepared for the exam. When I got a bad grade in high school I would convince myself that it wasn’t my fault because “I studied so hard.” But in reality, I didn’t study much, if at all. Sitting in front of a book is not studying. Thinking about studying is not studying. Mindlessly reading a textbook while scrolling through tumblr is not studying. You need to actively engage with the material and LEARN it. You aren’t there to memorize information, you’re there to learn. Study the material as if it’s something you want to remember for the rest of your life, not just something you want to remember for the next 8 hours. Studying can be a good experience, no matter what your previous experiences with it have been. I hated studying in high school and I was afraid it wouldn’t help. Now I enjoy studying because I genuinely enjoy what I’m studying and I create a relaxing environment for myself when I study. Studying can also become easier if you set goals for yourself. It can be things like “study for 20 minutes every day” or “reread old notes at the end of every week” or even “get at least an 80% on this next exam.” When you start to see results, even if they’re small, you’ll become much more encouraged to study and it will become much easier and more enjoyable.